During the breeding season, the black back of the Common Loon is "checker boarded" with a regular pattern of white spots, contrasting sharply with the pure white underbelly. This checkerboard pattern is similar to light reflecting off water and allows the loons to camouflage themselves from overhead predators. Similarly, the white underbelly also acts as camouflage by blending in with sky when observed by underwater predators. A "necklace" of white stripes graces the dark green/black neck. The bill is black and the eyes are red. Loons take baths and preen regularly to keep their feathers clean and waterproof. 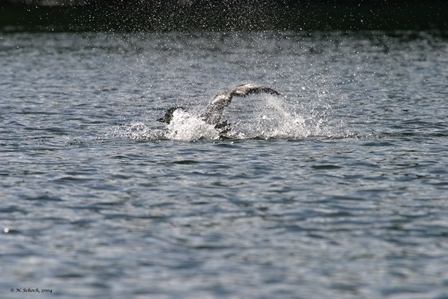 While bathing, loons roll, splash water about, and wing flap repeatedly, which can be mistaken for a bird in distress. Baths can last a ½ hour or more, before the bird settles down and begins to preen in earnest. Loons preen their feathers to keep them properly aligned for flight and waterproof for swimming and diving. A small gland, the uropygial gland, located near the tail produces oil which the loon rubs on the surface of its feathers to keep them waterproof. Loons squeeze a bit of oil from the gland, then rub their heads on their backs to waterproof the feathers on their head and neck, which are very difficult to reach. Occasionally, loons hold a foot above the surface of the water, especially when preening their white belly. They also “foot wag” to stretch their legs or to regulate their body temperature. If a loon is banded, it is easy to see the bands when it does a foot wag.